The XDP insulation set is used for quick and tight fitting vapour permeable or vapour barrier insulation around any window. 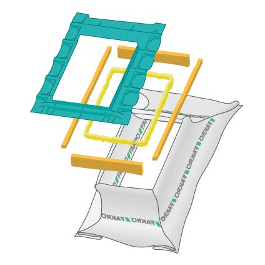 It consists of an air-permeable underfelt collar for connecting the window with roofing membrane used in the roof structure. The collar is made of a premium quality high vapour permeable EUROTOP roofing membrane. Sides of the flashing are made in such a way so that they enable laying the collar directly onto battens, regardless of the spacing between them or their thickness. Insulation material in the XDP insulation set is made of natural sheep wool which has been specially impregnated and consists of: sheep wool blocks 150x50mm and 70x50mm in section, sheep wool tress ø 50mm in diameter. The sheep wool insulating material offers the optimum density and high elasticity, ensuring perfect insulation and tightness around the window. Every window requires selecting a specific size of the XDP set. FAKRO extensive product range comprisis also a set of insulating flashings XDK. 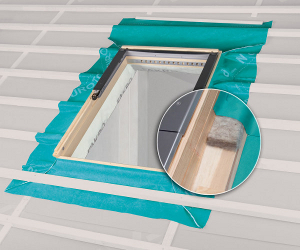 The set allows correct, fast and easy installation and insulation of FAKRO roof windows.